Next to a quiet woodland path in the valley of the Devil’s Water stand two large and graceful stone and brick gothic-style arches. They are the most visible remains of the once important Dukesfield lead smelting mill. This was probably the largest such smelting mill in the country for a century or so from the 1670s, central to one of the most important businesses in the northern lead industry, run by the Blackett and then the Beaumont family. Lead ore was carried in by packhorses from the high Pennine dales to the south and west, and the smelted lead – and silver- was carried on to the markets of Tyneside. Most of the routes used are now lost. From 2010 Hexhamshire parish council developed plans to conserve the then crumbling remains of the mill, and teamed up with Slaley parish council and regional charity the Friends of the North Pennines to seek funding. 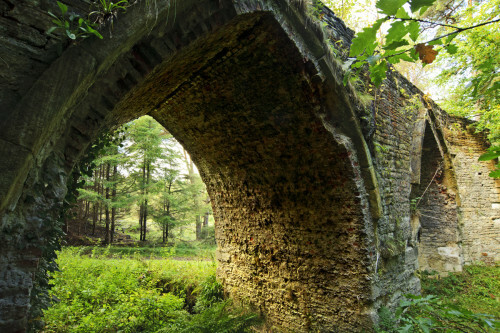 The ensuing Dukesfield Smelters and Carriers project received £250,000 in grant funding, mainly from the Heritage Lottery Fund to conserve the remains of the arches, research the history of the site, the industry and the people who worked in it, from the mines down to the quays, and explain and celebrate the site and its importance. Visitors to the site today can see the restored arches and archaeological discoveries made in the course of the project, explained in a series of information panels. More details on the project and its findings are available on the project’s website at www.dukesfield.org.uk. The Arches are between Slaley and Whitley Chapel in woodland on the banks of the Devil’s Water in Hexhamshire. OS GR NY 941 580 Nearest postcode NE46 1SG.